Are you a writer? Do you want to improve your reading skills? Would you love to discuss literary issues in a calm, relaxing atmosphere or you simply need somewhere to hang out on a Saturday afternoon? If yes, then the Farafina book review is for you. 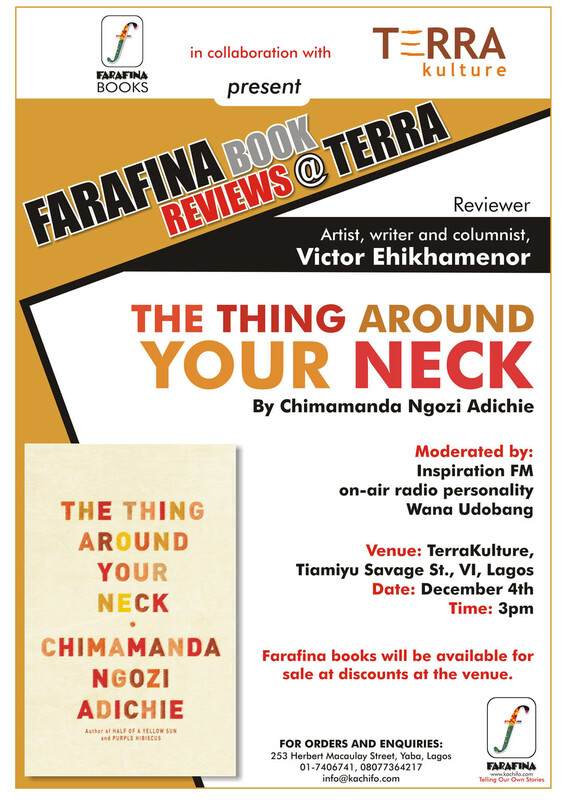 Join Victor Ehikhamenor and Wana as they review Chimamanda’s collection of short stories, The Thing Around Your Neck. Searing and profound, suffused with beauty, sorrow and longing, these stories map the collision of cultures and the deeply human struggle to reconcile them. As you know, this is a good opportunity to network with writers, readers et al. Also, there would be lots of munchies and free copies of The Thing Around Your Neck. What better way to spend a Saturday?! Don’t miss out! *Event starts by 3p.m on Saturday, 4th of December at TerraKulture, Tiamiyu Savage, V/I and is free to attend. story competition. Osemhen Akhibi’s Assassin’s Creed, was named winner ahead of Henry Onyema’s Trumpeter On Independence Day and Tolu Oloruntoba’s A Man Can Listen. Several criteria such as grammar, spellings, content and creativity were taken into consideration. We apologise that it has taken this long, here’s the winning story (our judges were unanimous in this decision!) Congratulations, Osemhen Akhibi! His name was Yusuf and, in a symbolic act of national cleansing, he was supposed to assassinate the President of the Federal Republic of Nigeria on Independence Day. The hiss of radio static from the walkie-talkie was his only company as he stood in the shadows of the amphitheatre waiting for a signal from the man he called General. He assembled his gun, the tripod and the scope with the ease that came from practicing this exact routine sixteen hours of every day for the past six months. Six months since the General had confidently walked up to him in a men’s room at the Transcorp, signed him a cheque and tabled plans for a coup that could only succeed if Yusuf played his part. “My father was publicly executed for attempting a coup… General.” He washed his hands, wiped them with a paper towel, and fixed the other man with a cool smile. He lit a cigarette and watched the festivities and merriment with a slight amusement. Mass self-deceit? Collective blindness? Plain stupidity? ‘Statesman’ after ‘statesman’ mounted the dais and extolled the virtues of the President and the dividends of democracy, and he felt an awkward mix of disdain and pity. They think this is all there is, they think it’s enough to make the right noises and appropriate gestures and the world would think all’s well with Nigeria. Or maybe they actually believe the rubbish they’re spouting. Poor fools. He felt the tremors before he saw the rising plume of dust and smoke that meant the bomb had gone off as planned. It’s time. He ground out his cigarette, released the catch on his rifle as the pockets of panicking celebrators turned to mass hysteria. He watched the Presidential security detail, headed by the General, herd the President off the dais and towards the back entrance, where he would pass directly beneath Yusuf’s location…and within sight of his rifle’s scope. Yusuf counted to ten in his native Hausa. “Daya…” Your father died for the Nigeria of his dreams… The Nigeria of his dreams; good roads…good schools… but most of all, the ability to sleep with both eyes shut. “Biyu…” They had taken that from him forever the night his father was dragged out of bed, court-martialed on coup charges and sentenced to death. “Uku…” Stick to the plan, Yusuf. One shot. “Hudu…” My father attempted to overthrow a military government, General. “Biyar…” Kill the President, Yusuf. “Shida…” Nigerians are so stupid, by God, they’re stupid. They don’t deserve a democracy. “Bakwai…” They reserve the right to make their stupid decisions. “Tarkwa…” He should never have come to me. “Tara…” Don’t do it, Yusuf. And then he pulled the trigger and shot the General. The publishing business is one most investors would rather not go into. Of course, this is not unconnected to the challenges and risks involved. However, the fact remains that no nation is complete without a thriving publishing industry. This article is a reminder of the relevance of the publishing industry. For some time now, I have been fascinated by this notion that change occurs first in the realm of ideas. To transform society, you will first have to change the mindset of the people. This is especially true for countries such as ours in which people are making the difficult transition from the traditional to modern ways of doing things. I decided to go into publishing because I thought publishing helped to define the ideas that shape society. In fact, I will go further to contend that publishing and the media industry lead change. This was what I was thinking 6 years ago and it all seemed to add up. There were about 120 million people in Nigeria. If I could sell edifying books to 1 percent of that population every year; that would be a decent number of books. I would have a solid business. I would also be doing my own bit to put my country on a path of growth and prosperity. These days, I have a more nuanced outlook. Six years ago, I did not anticipate the scale and quality of commercial infrastructure required to sell 1 million books to 150 million people scattered around a country roughly 4 times the size of Ghana. More crucially, I did not know then, that if you set up an independent publishing business in Nigeria you could be competing with some of the most formidable entities in the English speaking world. While we import everything, the publishing houses I was setting out to compete with, are solidly backed up by the cultural policies of the government of the United Kingdom, and actively supported by the EU. And lately, those of the United States and India, happily projecting their soft power, while opening up new markets, all across Africa. Working in tandem with public institutions in those countries are also private trusts and endowments that are carefully coordinated to find and nurture talent, and to guarantee the development of benign self-expression in society. There is a clear appreciation of a government’s vested interest in facilitating the success of every hard-working, tax-paying, talented individual or corporate entity involved in the production of culture. My point here is that the most socially and economically advanced nations also happen to be the most successful at encouraging the flowering of new ideas in their countries and at managing the ways these ideas are brought to life for the benefit of society. I have come to appreciate the vital importance of governance in creating an environment that compels society to look inwards regularly and imagine a better future. It also empowers individuals and institutions within society to make the necessary plans and do whatever it takes to build that imagined future. I suspect that even if we had no natural resources but had good governance, we could be as productive, developed and respected as any country on this planet. When Kwame Nkrumah said, “Seek ye first the political kingdom and everything else will be added unto you,” he was making an impassioned rallying call for good governance and necessary sacrifice that must be made for nation building. Kingdoms are strenuously fought for and hard won. Now, if ideas do indeed lead change, I would contend that nations that have lifted the majority of their people out of poverty are able to do so, precisely because they know how to stimulate useful ideas in society. They know how to stimulate, collate and transform the best of these ideas into values, canons, mores, trends, fashion, gadgets and other products, which are able to transform the lives of the majority of their people. The educational policies of these countries are carefully crafted within a larger cultural framework that involves public and private institutions, to facilitate the synthesis of innovative ideas into products that are sought after locally and the world over. These countries have resourceful and vibrant publishing and media industries, which are actively promoted and empowered as a matter of national policy. These nations actively encourage and subsidize the production of culture. By facilitating the free flow of ideas through society, the publishing and media industry empower individuals and communities to create environments that enable new ideas flourish. Visionaries in the arts, the humanities and sciences imagine a better future, and visionary politicians; working with community leaders and businessmen, build it. Change is what happens when you mix good ideas with clear vision and disciplined industry in a matrix of responsible, reflective and resourceful leadership. Publishing engenders change and development, by helping to stimulate new ideas, and by helping to propagate them. Publishing and the media industry do for culture and social development, what the banks are supposed to do for the economy and social development. In a world in which powerful nations have come to accept that it is less expensive and more enduring to conquer hearts and minds rather than physical space, a world that is beginning to value the effective deployment of soft power over hard military power, a world in which vigorously contested proxy wars are being fought by the global powers in the areas of finance, commerce and culture; publishing and media organizations are now at the vanguard of engagement in the international political economy. The local publishing and media industry is way too strategic for Nigerian national interest. Our nation allows it to flounder at its own peril. *This article was written by Muhtar Bakare, Publisher, Farafina Books and published in Next newspapers. Come obtain your favourite Farafina titles at heavy discounts this weekend. Farafina Books would be at My Style Factory, an initiative of Morsi PR. It’s a one day exhibition for designers and fashion vendors to display their exotic ranges. It is also “a most veritable platform for the exhibition of wares, outfits, accessories, books and everything else in between”. Event starts by 12 noon and holds at Coral Hall, Idowu Martins, Victoria Island, Lagos and is free to attend. See you there! The monthly Farafina book review held on the 6th of November, 2010. The book for review for this month’s edition was To Saint Patrick by Eghosa Imasuen. To Saint Patrick is a work of alternate history. Set in Benin City after elections, Hadiza and Ayo, police officers are investigating a murder. They soon find themselves embroiled in a set of larger and more dangerous intrigues that could cost them all they have worked for. NEXT featured an article in its arts and culture section about the book review. We have taken the liberty of pasting an excerpt below. Enjoy! It was an afternoon of enlightenment and amusement during the monthly Farafina book review which held at Terrakulture on November 6, 2010. Farafina launched the initiative some months ago in a bid to propel African writing and the reading culture. The book of the day was Eghosa Imasuen’s ‘To Saint Patrick’ and the review was done by culture activist, Toyin Akinosho. The anchor was radio presenter, Wana Udobang. Ahead of the review proper, Imasuen, read excerpts from his book and fielded questions on a number of issues raised by the narrative. 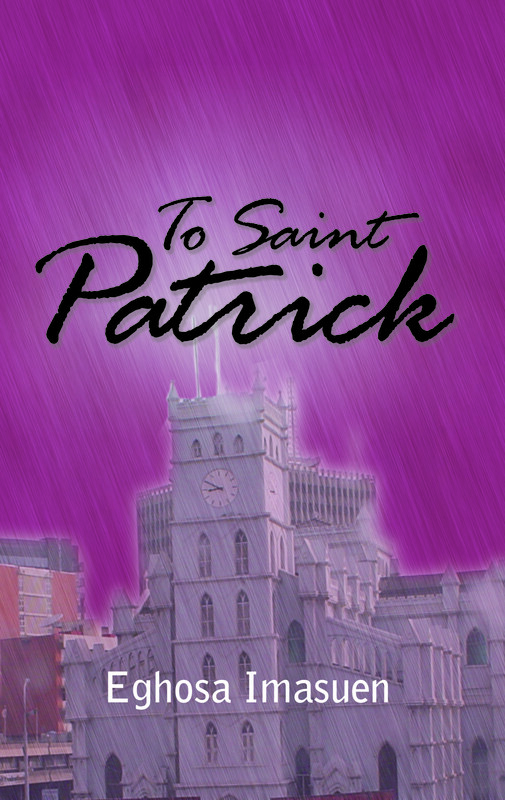 ‘To Saint Patrick’, an alternate history fiction, was published in 2008. It is set in a Nigeria where the late Murtala Muhammed survived the 1976 coup and the coup plotter Buka Suka Dimka was apprehended. Imasuen who confessed that he was fond of Sci-Fi, horror and dark fictions, said he had always wanted to do an alternate history novel. The author recalled that his mother used to tell him stories about the period when Murtala Muhammed was assassinated. 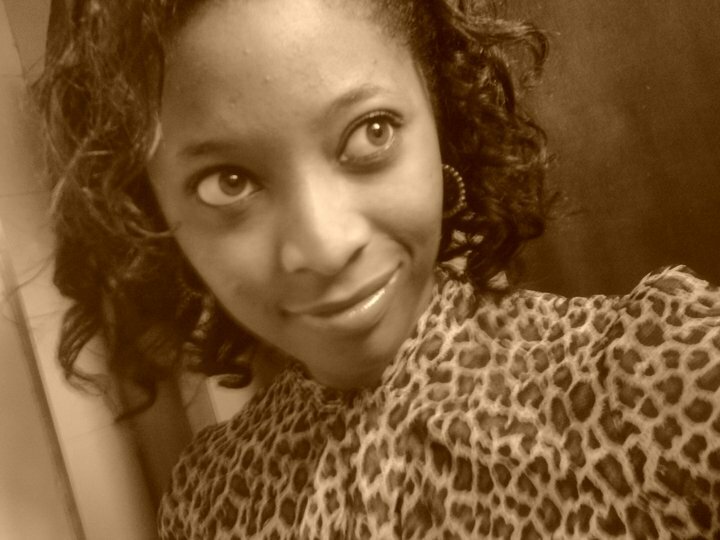 She was at the University of Ibadan at the time. Also, he had an Uncle, an Itsekiri man who as a soldier during the period of the civil war, who narrowly escaped being killed by Federal troops. And then there was the Asaba massacre of 1967. These were stories Imasuen had been told by family members who had been witnesses to some of these events. So naturally, they aroused his curiosity and piqued his interest. He added that his interests found the right opportunity for expression when he decided to start writing the book. “The book is a treatise on what constitutes heroism and villainy, and if someone could be allowed to make up for past sins”, Imasuen said. Commenting some more on the prevalence of ‘what ifs’ in the novel, the writer revealed, “I wanted to see how things could have been with a left-leaning Government in 1979”. The idea of speculation is to contemplate how Nigeria would have turned out if some of those defining moments in the nation’s history had taken a different course. Imasuen studied Medicine at the University and had never written seriously before although he enjoyed reading. “I always envy those who say they have been writing since they were children,” said Imasuen humorously to the audience. On how he eventually began, he said, “I started writing after an argument with my mother about stagnation”. His mother had teased him about becoming a stereotyped doctor and getting stuck in the rut of medical practice. She suggested he try his hands at writing as it was something he had always had some sort of interest in. However, his initial attempts were awful. However, it was after he read Chimamanda Ngozi Adichie’s ‘Purple Hibiscus’ that he began to get the hang of writing. “The book spoke with my voice,” he disclosed. After finding his feet, he began to write and was fortunate that Kachifo (Farafina) found the story fascinating and refreshing when he sent it to them. The rest, as they say, is history.